Above: Conditions at the site prior to erosion control work. 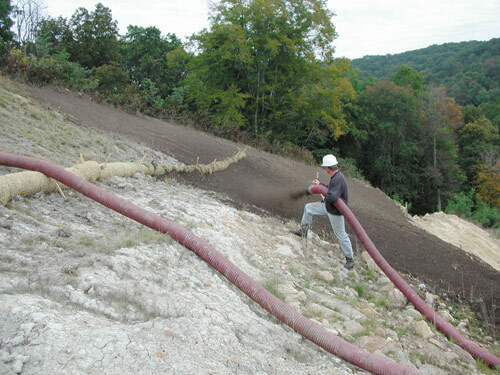 Below: Pneumatic application of Erosion Guard soil. Advances in bonded fiber matrix technology offer new opportunities to take advantage of the speed, ease and economics of hydraulic seeding techniques in solving difficult erosion problems. That was one of the lessons driven home recently during construction of an elementary/high school/football stadium complex in the steeply sloping terrain of southeastern Ohio. 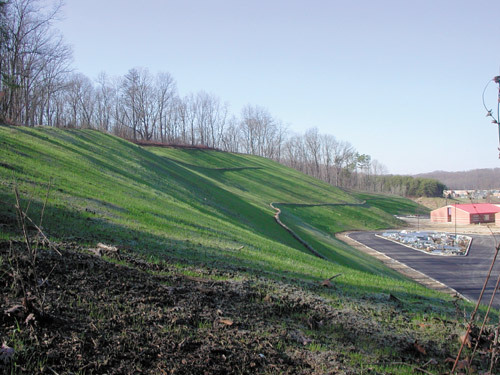 The Rock Hill School District project near Ironton, Ohio, illustrates how new mechanical bonded fiber matrix erosion control material and practices, like a custom-mixed, pneumatically applied soil, are being used to comply with tougher erosion and sediment control requirements. That includes the new NPDES Phase II regulations which become effective in March, 2002. Gilbane Bulding Co., Minford, Ohio, is the construction manager on the three-year project, which is expected to be completed later this spring (2002). Construction required excavating and moving about 600,000 cubic yards of dirt on either side of a road that cuts through the 50-acre site in the spring of 2000. That earthwork left about five acres of the steep exposed slopes on the north side of the road and another three and a half acres of similar slopes on the south side. Controlling erosion on those slopes posed a daunting challenge. Many stand more than 80 feet high with a gradient of 2:1, including 1:1 pitches in some places. The slopes, which extend about 180 feet, are composed mostly of sandstone, a material which looks and feels like rock but erodes easily. Over time, rain drop impact and freeze-thaw cycles loosened the soil particles. Stormwater runoff carved long, gaping scars, some as deep as three feet, into the slope faces, carrying sediment down hill and dumping it at the base of the slopes. There, the sediment flowed onto parking lots, sidewalks and the athletic field, oozed around footings of buildings and clogged catch basins and storm sewers. "We wanted a long-term solution to the problem using vegetation, and because of the steep slopes, we wanted something that required little maintenance," says Warren Whitesell, project engineer with Gilbane Building Co. The vegetation would provide a canopy to protect the slopes from the erosive impact of rain drops and a root system to anchor the soil in place. But, how do you grow plants in the existing soils which are low in nutrients and water-holding ability? And, even if you spread a typical top soil on the slopes, how do you hold the soil in place until the vegetation becomes established? Only two contractors were willing to tackle the job. Earthco, Inc., Columbus, Ohio, won the bid. Doug Peabody, president of the company, proposed an inventive solution that combined a mixture of hydroseeded grasses and legumes to vegetate the slopes with a variety of recently-developed products to enhance plant growth and eliminate the possibility of any soil loss. Spreading Erosion Guard with a dozer on the steep slopes. To support growth of the vegetation, Peabody recommended using a special soil mixture, called Erosion Guard. Developed with the assistance of a university agronomist, the ingredients include indigenous soil, sand, composted yard waste and sludge (treated to remove any heavy metals) to strengthen the soil's ability to hold on slopes. The soil also contains additional mycorrhizae, which promote root growth. "This soil is similar in texture to a sandy loam with interlocking characteristics and has high organic matter providing a high nutrient content and high moisture-holding capacity," Peabody says. "This soil provides an ideal growth medium for the selected plant species. Eventually their roots will penetrate through the Erosion Guard to hold the underlying soils in place." The seed mixture which Peabody provided for the project consisted of Spartan hard fescue (100 lb./acre); creeping red fescue (150 lb./acre); transit intermediate ryegrass (75 lb./acre); empire birdsfoot trefoil (30 lb./acre); and crown vetch (20 lb./acre). To break up the slope lengths and reduce the velocity and erosive force of stormwater runoff, Peabody advised staking 12-inch diameter oat straw wattles at 50-foot vertical intervals on all the slopes. These would replace silt fence, a common sediment control practice in this area. "We think the straw wattles control sediment much better than silt fence," Peabody explains. "Also, they are much easier and faster to install on steep slopes than silt fence. Filter berms, 1 foot high and 2 feet wide and made of composted yard waste, were installed at the top of the slopes. They worked out really well." 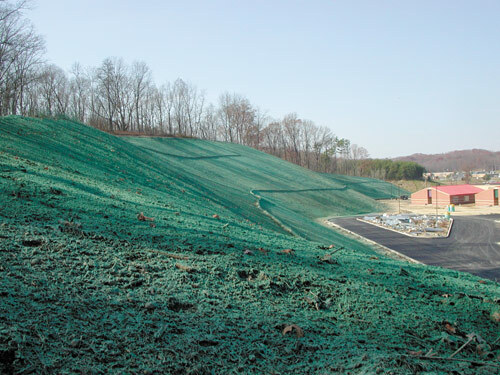 To protect the seeded slopes from wind and water erosion until the vegetation could become established, he recommended using a new-generation bonded fiber matrix - Conwed Fibers® 3000 M-BFM from soil solutions company PROFILE Products LLC. "It was critical for this project to address erosion concerns aggressively," says Dwight Johnson, regional manager for PROFILE. "There were a lot of challenges and the M-BFM would provide the additional protection for immediate germination, thus stabilizing the steep slope." Above: View of the slope following application of the Conwed 3000. Below: View of the same slope approximately six weeks later showing the establishment of grass. "In addition to the steep angle of the slopes, the length of the slopes was a big concern," notes Kevin Heileman, Firelands Supply Co., which supplied the Conwed product for the project. "The longer the slopes the amount and force of the runoff from a heavy rainfall can really build up on the lower end of the slopes. A hydraulic wood fiber with tackifier wouldn't have held up to protect the slopes. A rolled erosion control blanket, on the other hand, would have done the job. But, installing them would have disrupted the surface, which we wanted to prevent. All these factors pointed to using the M-BFM. It was a great fit for this job." Regular BFM erosion control products create a matrix of wood fibers and bonding agents that blanket the soil surface and remain bonded, soft and pliable after it cures. Spaces within the matrix absorb oxygen and water and reduce evaporation to improve seed germination. Like a conventional BFM, the M-BFM technology is a hydraulically applied mixture of wood fibers and bonding agents that can replace conventional rolled erosion control blankets in many cases. Unlike BFMs, it features mechanical bonding in addition to chemical bonding of wood and synthetic fibers. The interlocking defibrated virgin wood fibers and patented crimped synthetic fibers produce a matrix that's almost 50 percent thicker than a conventional BFM. However, it weighs no more per unit area of coverage. As a result, it can withstand higher rates of surface flow energy for better erosion control. In addition, the synthetic fibers keep the wood fibers from contracting the soil directly, slowing degradation and extending effective life of the product. It also requires no cure time to be effective. Because M-BFM technology conforms closely to surface irregularities like dirt clods, rock tree branches and other debris, it can be applied without the site preparation work. Also, it can be used to protect inaccessible slopes. Advanced chemistry also enhances performance of Conwed Fibers 3000 M-BFM. A super-absorbent agent increases water-holding capacity of the matrix by 50 percent, compared to a conventional BFM. This reduces runoff and improves plant growth. The product also features a number of cross-linking polymers instead of the single hydro-colloid used in other BFM products. Consequently, it begins stabilizing the soil as soon as it is applied. By contrast, other BFM products may require eight hours or longer to cure properly before they become effective. That increases flexibility in scheduling projects, especially if rain is expected. Although Peabody had never used the M-BFM, he was impressed with results of rigorous independent testing of the product at the San Diego State University's Soil Erosion Research Lab. The tests were conducted on fill slopes with simulated rain events. 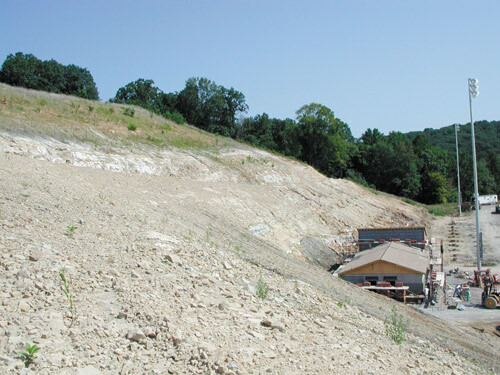 When applied at the rate of 3,000 pounds per acre and subjected to a 10-year storm event, the fully-cured product reduced erosion by nearly 100 percent compared to a non-treated control slope. Even when allowed to cure for just two hours prior to a 10-year storm, the same rate of application cut erosion by 98 percent. In three consecutive 50-year storm events, the fully-cured product applied at 3,500 pounds per acre reduced erosion by nearly 100 percent. "Those results convinced me that the product was a good choice and that this would be an ideal project for it," Peabody says. Effectiveness in controlling erosion wasn't the only reason that Peabody suggested using this BFM. "Installing an erosion control blanket hydraulically reduced our safety concerns on these steep slopes," he says. "Also, we concluded that the hydraulic installation was very economical and cost effective." The erosion control work began Sept. 23, 2001. First, the Earthco crew used hand-held mechanical equipment to remove unwanted vegetation from the slopes. Then, a bulldozer was used to fill in the eroded areas and provide a smooth slope surface. Where that wasn't possible, crews using hand tools did the work. 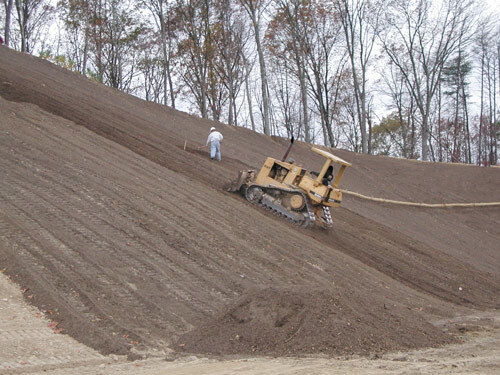 To finish slope preparation, the dozer spread a 5-inch thick layer of Erosion Guard soil, containing one-third of the total seed mixture, on the slopes. In this process, the grouser tracks created shallow, horizontal trenches on the slope surface. These small depressions helped prevent seed from washing off and retain moisture for better seed germination. "Dan Bouts, the dozer operator, was able to work on some pretty steep areas," says Peabody. "Where he couldn't operate we applied the soil pneumatically, using 40-cubic yard blower trucks." After the initial application of the 5-inch layer of soil and seed, another one-inch layer of the special soil, along with another one-third of the seed mixture, was blown onto the slopes. Next, the remaining one-third of the seed mixture and all the fertilizer was applied hydraulically on the slopes. Then the M-BFM was applied as the final step. The slurry was sprayed as evenly as possible at the manufacturer's recommended rate of 3,600 to 4,000 pounds per acre in two passes. First it was sprayed in a vertical manner, and then horizontally. This spraying pattern prevented masking of the spray to produce uniform coverage. "We divided the seed mixture into three equal applications to achieve a uniform treatment with consistent seed-to-soil contact," Peabody says. "That was our insurance policy to help promote good seed germination." The erosion control work was completed October 31. Unusually warm and dry weather continued for the next month or so. During that time the Earthco crews used their hydroseeder to irrigate the treated slopes every other day to prevent seed desiccation from wind and warm temperatures, especially in the top of the soil where consistent moisture is critical for germination and root penetration. The first heavy rains began in the last week of November. By that time, Peabody reports, seed had germinated in all the treated areas. "Grass didn't germinate on the face of some of the steepest sandstone rocks, although grass was beginning to grow aggressively within the cracks and crevices," he says. "The birdsfoot trefoil and crown vetch had also started to grow and, in time, should cover the faces of these nearly vertical slopes." Erosion was being controlled effectively through mid-December. "Up to this point, things look good," says Whitesell. "It will take a while for the birdsfoot trefoil and crown vetch to show much growth, but the grasses are growing. Also, we've pretty much eliminated any erosion." "So far we're very well satisfied," adds Lloyd Evans, superintendent of the Rock Hill School District. "We have a good stand of grass on the hill and the soil mixture is sticking on the slopes. Based on these results, we wouldn't have done anything differently to control the erosion." This project highlights the importance of keeping an open mind when it comes to controlling erosion, notes Peabody. "Every project is different and must be treated accordingly," he says. "However, if you don't have a viable growing medium it is difficult to provide vegetative germination for increased soil stabilization." More information about the project is available from Peabody at: EARTHCO, Inc. 2287 Dublin Rd., Columbus, OH 43228; (614)481-7645; Email: dougp@earthco.org. For more information about PROFILE Products please direct all inquiries to 750 Lake Cook Road, Suite 440; Buffalo Grove, Ill. 60089; (800) 207-6457; www.profileproducts.com. ©2002, 2001, 2000, 1999, 1998 Land and Water, Inc.